Energy Sector Asset Management Architecture: This diagram depicts the proposed high-level architecture to help improve an energy provider’s asset management capabilities. This architecture demonstrates a single physically remote site that contains the sensor and remote monitoring technologies specific to this project. 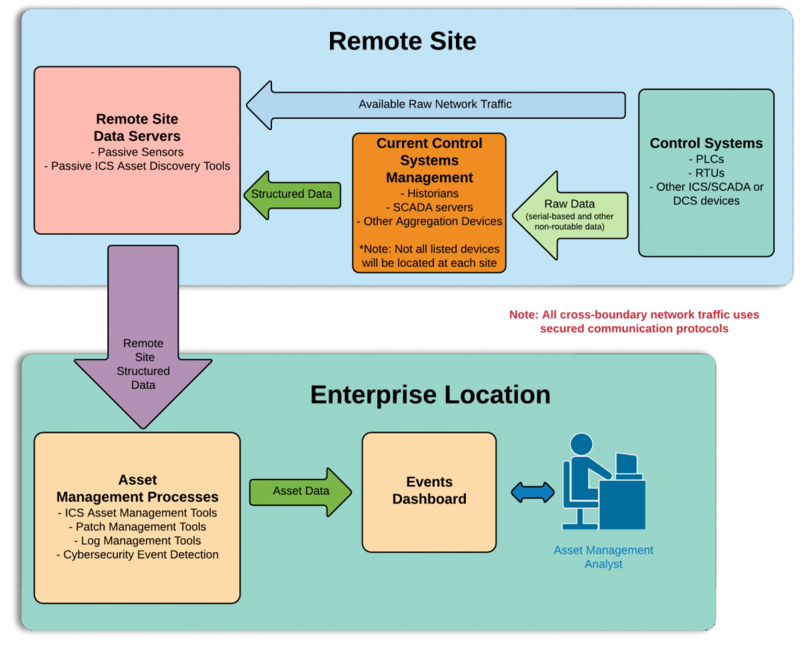 This individual remote site is modular and can be scaled to represent other remote locations that feed information back to a single centralized enterprise location. There may be more than one remote site in this build. In response to a call in the Federal Register, these companies submitted capabilities that aligned with desired solution characteristics listed in the project description. These technology collaborators were extended a cooperative research and development agreement (CRADA; see example), allowing them to participate in a consortium where they will contribute expertise and hardware or software to help refine a reference design and build an example standards-based implementation. As part of this collaboration, the NCCoE will compose and release a publicly available National Institute of Standards and Technology (NIST) Cybersecurity Practice Guide (Special Publication 1800 series), which will document the reference design and help organizations in the energy sector effectively identify, control, and monitor their operational technology (OT) assets. OT /Industrial Control Systems (ICS) are used in the energy sector and other critical infrastructure sectors to manage industrial operations. Disruptions to OT/ICS assets can result in economic loss and interruption of critical services to millions of consumers. Energy providers recognize the need to improve their OT asset management capabilities, especially for remote assets, to mitigate vulnerabilities and opportunities for malicious attacks. In partnership with the selected technology collaborators, the NCCoE will implement the collaborators’ commercially available products in a laboratory environment to build a standards-based, modular, end-to-end example solution that will address the security challenges of OT asset management for the energy sector. Interested parties are encouraged to engage with us through our project web page. If you have additional comments or questions or would like to join the community of interest that is helping guide this project and provide feedback, please email us at Energy_nccoe@nist.gov. *Certain commercial entities, equipment, products, or materials may be identified to describe an experimental procedure or concept adequately. Such identification is not intended to imply recommendation or endorsement by NIST or NCCoE, nor is it intended to imply that the entities, equipment, products, or materials are necessarily the best available for the purpose.